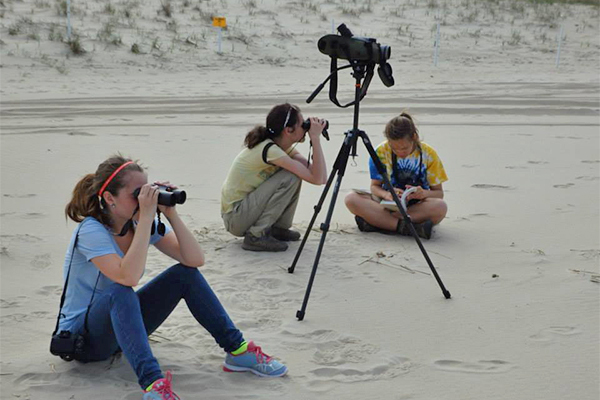 Four University of Delaware students spent a Saturday in May traveling up and down the state looking to identify as many species of birds as possible to raise funds for the Delmarva Ornithological Society’s Bird-a-Thon 2014. The bird-a-thon is a pledge-based fundraising effort in which individuals or teams count the number of different bird species seen or heard in a 24-hour period with proceeds going to protect habitat for migratory shorebirds and to fund migratory raptor research along the Delaware Bay. The student group included Abby Walter, Kimberly Serno, Kerry Snyder and Laura Young, all wildlife conservation majors in the College of Agriculture and Natural Resources (CANR), who started off at 6 a.m. along White Clay Creek, traveled as far south as Cape Henlopen and ended the day at the St. Jones Reserve in Dover, identifying a total of 110 species along the way. That was a significant increase over the 59 species they identified last year. In total, the group raised $1,154.78. “We had almost $8 pledged per bird and we saw 110 species,” said Walter, president of the Wildlife Society at UD. “Everybody pledged money for each species that we saw, so we raised a lot of money that way, and then our bake sale raised about $200.” Five UD professors and one supplemental faculty member from the Department of Entomology and Wildlife Ecology — Jake Bowman, Doug Tallamy, Jeff Buler, Greg Shriver, Kyle McCarthy and Vince D’Amico — all pledged funds to the group, as did Tim Schreckengost, a master’s degree student in CANR. “They did it the previous year and we joked with Abby that they were hustling us because they only saw 59 species the year before and then this year they saw 110,” said Buler. “I think they tripled their donations from the previous year.” Walter, who is also an ecology major, said, “When we first sent out the email requesting donations, our one professor copied other professors and he was challenging them to meet his donation, so that was pretty funny. It was really great that we had so much support.” During their excursion through the state, the group saw many interesting birds such as a red knot at Cape Henlopen, which Walter said is sustained on the eggs laid by horseshoe crabs when it stops over on its long trip from South America to the Arctic. The group also pointed out black skimmers, scarlet tanagers and glossy ibis as interesting birds, and noted that they saw a few birds — especially shorebirds — they had never seen before. Walter said that when they saw a brown-headed nuthatch, it was a “life bird” — a bird species seen for the first time — for Young. Buler said it was great to see students apply what they learned at UD to the real world, especially in such a fun and beneficial way. “The students took an ornithology class where we taught them how to ID birds so that they could go out and then identify them for the Bird-a-Thon,” said Buler. “They also went to places where we take our students. I teach a habitat management class where we take the students on field trips to different private and public conservation areas like Bombay Hook, and they learn about how wildlife are managed. They gained some familiarity about where to go from classes that they took.” Not only did the classes help them discover conservation areas around the state, it also helped spark their interest in birding. Walter in particular said she honed her birding passion during her time at UD. “I didn’t really start bird watching until I started college. In sophomore year, I started volunteering at the Ashland Nature Center Hawk Watch and the spring after that, Dr. Bowman took the Wildlife Society on a bird walk at Bombay Hook — that was when I started to realize how many birds there actually are in the world and it’s pretty cool.” Serno said that she considers herself a casual birder and became “birding buddies” with Walter on a study abroad trip that they took to Costa Rica this past winter with Shriver. Walter made it clear that without the help of so many people, the Bird-a-Thon effort would not have been as successful as it turned out. “Basically, we couldn’t have done this without help from a lot of people — all the professors, my family, everybody else’s family, and the Wildlife Society.” Article by Adam Thomas Photos by Abby Walter, Kerry Snyder and Laura Young This article can also be viewed on UDaily.